Blue with Orange Flowers gable box is now a closeout! Blue and orange isn't just for the New York Mets. The blue background compliments the orange flower design perfectly (seriously - on the color wheel blue and orange are complementary colors). So there’s literally no way for someone to say that the colors don’t match and then try to steal your lunch. All you have to do is show them a color wheel and they’ll apologize and run off scared. Show your bullies this lunch box and the floral design will diminish their tough guy attitudes. They'll fall so in love with it, that they'll want to be your best friend instead of your worst enemy since it compliments any style! These Gable Lunch Boxes are also great for those holiday deliveries filled with all kinds of treats. Give your bully a chocolate or a cookie carrying this lunch box and they'll definitely never shove you in a locker again! 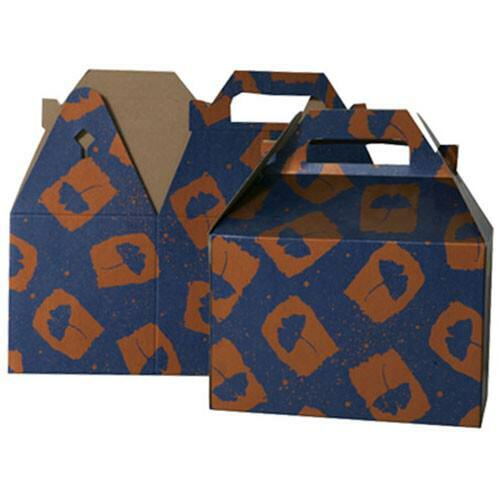 Gable Lunch Boxes (also known as Duncan Donut boxes) are sturdy kraft boxes with handles. Bully proof!